(Release Date: July 8, 2014)  "Rigor Mortis" is steeped in the traditions of Eastern culture and folklore, but it is also undeniably inspired by producer Takashi Shimizu's (director of 2002's "Ju-on: The Grudge" and its 2004 U.S. remake "The Grudge") past projects, right down to the sight of dark-haired specters crawling across the floor. By now, this cliché of Asian cinema (and the American movies that have since aped this image) is exceedingly tired, typically a sign of a lack of confidence from filmmakers who aren't willing to take their own creative chances. In the case of Juno Mak's debut feature, the film does go in some loopy alternative directions in spite of its derivative characteristics, he and screenwriters Philip Yung and Lai-yin Leung spinning an esoteric supernatural horror-fantasy involving fate, suicide, vampires and ghosts. These spare parts, however, never form a comfortable whole, the characters not developed enough to care about and its CG effects overused to the point of artifice. Plagued by his estrangement from his wife and young son, actor Yau (Anthony Chan) moves into a deteriorating apartment complex with the intention of killing himself. When he is narrowly saved, a presumably positive turn of events instead proves to be the catalyst for a downward spiral of tragedy which befalls Yau's neighbors. Cue black smoke, red tendrils, twin ghosts, a corpse resurrected into a vampire by his mourning wife, and a fleet-footed little boy with a blond bowl-cut so fake-looking it takes half the film to realize he is not simply a figment of Yau's imagination. Set entirely within the confines of the apartment building where Yau moves, "Rigor Mortis" crosses into batshit craziness throughout, the film feeling more like a series of ideas than an example of cohesion. Lacking in scares and suspense, the picture throttles its audience with visual effects and evocative imagery, but never gets to the heart of the characters. Thus, the experience is an indifferent one, in spite of director Juno Mak's willingness to toss in everything but the proverbial kitchen sink. Shot digitally with the Red Epic camera, Man Ching-Ng's ashen cinematography and post-production color filtering may compromise the finer details of the initial camerawork, but this is all in keeping with the aesthetic vision which "Rigor Mortis" possesses. The Blu-ray's 1080p showcase of a not-quite-monochrome palette leans toward grays, browns and steely blues, and they all appear accurate to source. There are no hints of banding or print damage to be found. The Cantonese 5.1 DTS-HD Master Audio (with optional English subtitles) rumbles with spirited stamina throughout, the dialogue-centric scenes kept mostly to the front channels until the mystical apparitions are unleashed. This is a potent sound mix when it wants to be and is solid throughout. A Cantonese 2.0 Stereo audio track is also offered, as are dubbed English 5.1 DTS-HD and English 2.0 Stereo options for the subtitle-phobic. 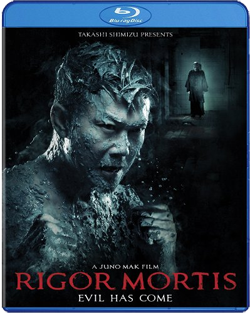 Well Go USA Entertainment's Blu-ray release of "Rigor Mortis" exhibits attractive A/V specs, but doesn't offer anything substantive in the way of bonus content. This leaves the movie itself to plead its case, and it doesn't do a particularly convincing job. Asian cinema enthusiasts could do much worse and might want to check the film out as a rental. All others needn't bother.